Near Round Lake, Stonecrafters is the first choice for granite counter tops, and our team will assist you in choosing the granite countertops that perfectly fit your décor. Our field measurement team will create a perfectly fitting template for your granite kitchen countertops, and our installation crews will deliver and install your new custom granite countertops efficiently and professionally. You can rest assured that we are committed to customer satisfaction and we uphold our values of integrity, service, and quality to the highest standard at Stonecrafters! The village of Round Lake is a northern suburb of Chicago in Lake County, Illinois that is working diligently to improve the quality of life for the more than 19,000 residents. Near Round Lake, the most beautiful granite counter tops can be found at Stonecrafters. We carry only the highest quality granite, at the most affordable prices, and our team will provide accurate field measurements and complete the installation of your granite kitchen countertops efficiently. Granite countertops are becoming more popular due to their natural beauty and durability. 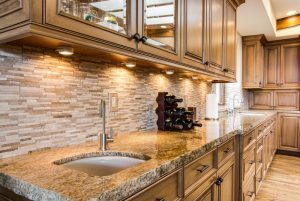 Whether you are looking to improve your kitchen, bathroom or other living space, you will find the best granite countertops for your home at Stonecrafters near Round Lake. Granite kitchen countertops will last for many years and are easy to clean and are relatively low maintenance. Granite is a natural stone and possesses a unique texture and design giving you a truly one of a kind countertop masterpiece. Resistant to heat, scratches and stains make granite countertops the ideal choice for kitchen and bath. Call Stonecrafters today at (815) 363-8730!